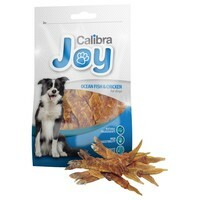 Calibra Joy Ocean Fish & Chicken are tasty and easily digestible treats made using delicious pieces of real Chicken and Ocean Fish. Naturally low in fat and high in protein, these mouth-watering treats are also packed with unsaturated fatty acids that will help to promote healthy skin, a glossy coat, and enhance the immune system. Your dog will love the juiciness and chewy texture these delicious treats offer.